I love December! It's my favorite month of the year because of all the festivities going on, and I always feel really happy looking at all the Christmas lights on all the houses. 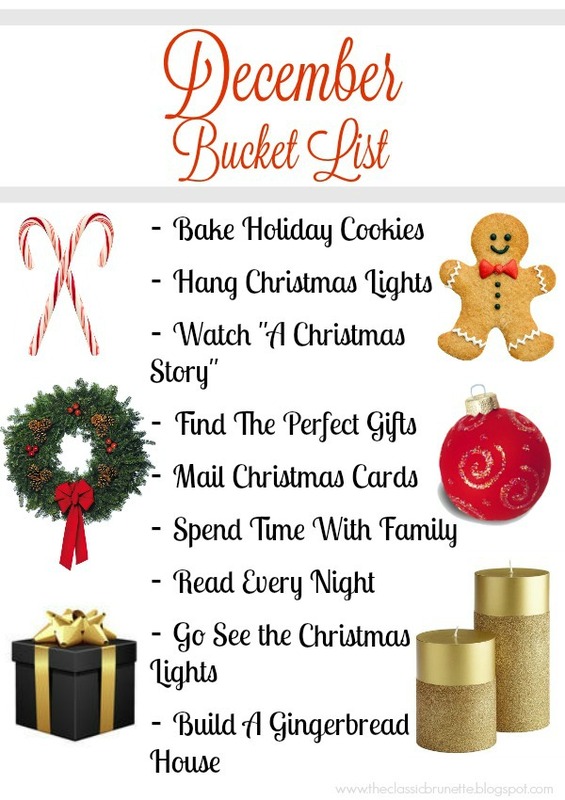 This bucket list is very Christmas-based, so for everyone who doesn't celebrate that I'm sorry! What's on your December bucket list? If you don't follow me on twitter, you may not be aware of how excited I was to score Tory Burch boots for 50% off! I've wanted these boots for a while now; they were the perfect color, the perfect height, the perfect everything, everything but the price that is. I pride myself on not paying full price for many of the things that I buy, so spending $500 on a pair of boots, no matter how perfect they were, was completely out of the question. When they went on sale, I knew I had to get them. Yes, they were still way too much for my budget, but after pining for them for so long I knew they wouldn't go to waste. I already have so many outfits I had planned to wear with riding boots, and so many occasions I can wear them to. I knew that after wanting them for so long (almost a year) that it wasn't just a trendy thing I would wear a few times and then have them sit in my closet gathering dust. I honestly have no regrets about buying these boots and am so happy I made the purchase! 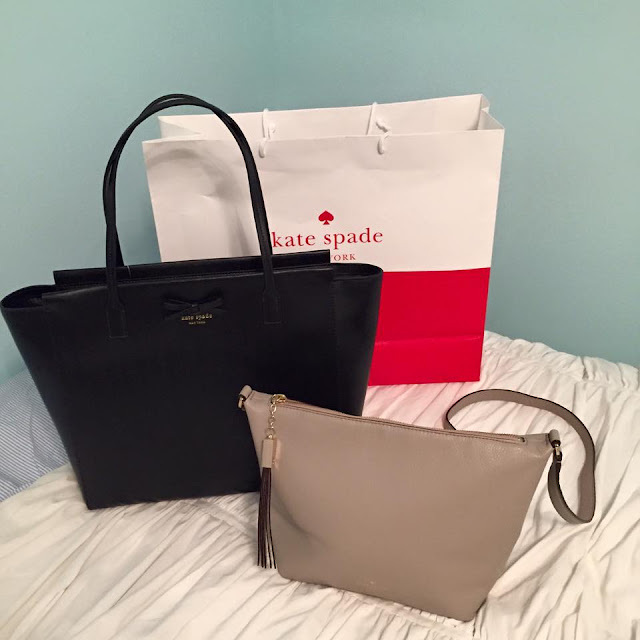 I also happened to stop by the local Kate Spade outlet during the Black Friday weekend and bought myself a new day bag for school as well as an everyday cross body. 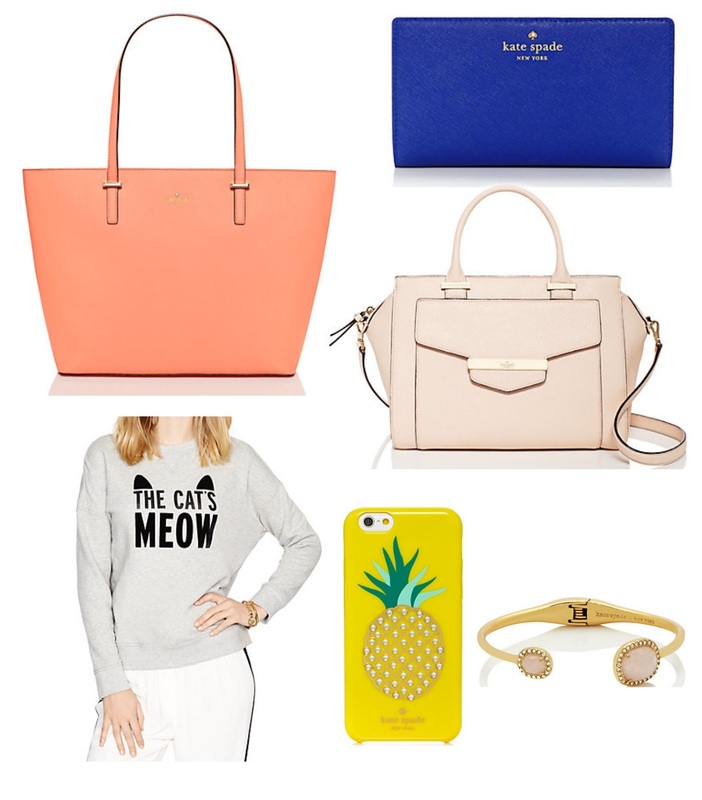 Kate Spade is one of my favorite brands. All my wallets (and by all, I mean 2) are from there, and they are such great quality along with being so pretty! I had been having terrible luck finding a good everyday cross body bag. To start off my bad luck, lets travel back to freshman year of college where the first day without my parents, my bag literally fell to pieces. The new bag I got lasted for a while, but kept getting dirt and crumbs and dust on it no matter what I did. After that one, the next purse's strap detached, then the next one's zipper pull fell off somewhere while I was wearing it, making it useless, and me bag-less once again. I decided it was time to invest in something of actual quality that would last me more than 6th months. Because of my love for Kate Spade, I knew it was the perfect place to get my new purse. I also grabbed a tote for school since my current one is breaking, and the sale was just too good of a deal to pass up! I think you really have to love the item or brand you're splurging on to know when it's okay to spend that much money. 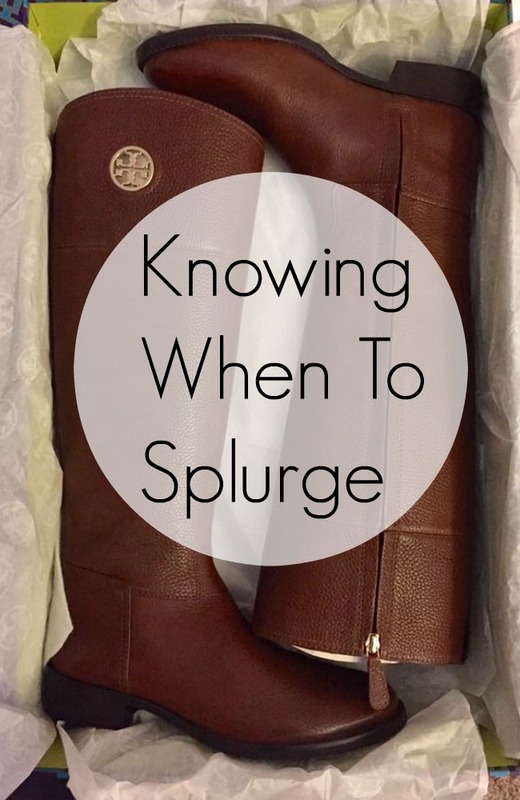 If I hadn't been such a huge fan of the Tory Burch boots for so long, I definitely wouldn't have bought them. If something you like is on the expensive side of the shopping spectrum, you really need to take some time to think about that purchase. If you still think those shoes or dress or whatever it is, is still worth it months later (or a month later, I know some stores don't keep things for that long) then take a little bit more time to make sure you're comfortable spending that money. Think if you have anything similar to that in your wardrobe, or if there are any similar options out there that are of similar quality, but less expensive. If it's an expensive brand you like, keep your eye out for the styles that catch your eye every time you look at the collections. Don't impulse buy just because you think you can't live without it in that second. Again, take your time, see which item you like and need the most. For me, I desperately needed a sturdy cross body, so that was the item I decided was worth the money. My ultimate piece of advice is to always look for a sale. Expensive brands still go on sale, even if it's just 15 or 20% off. Sign up for email lists from those brands to get notice of sales. Sometimes stores even send a coupon through your email by signing up! Did you guys get any great deals on Black Friday? 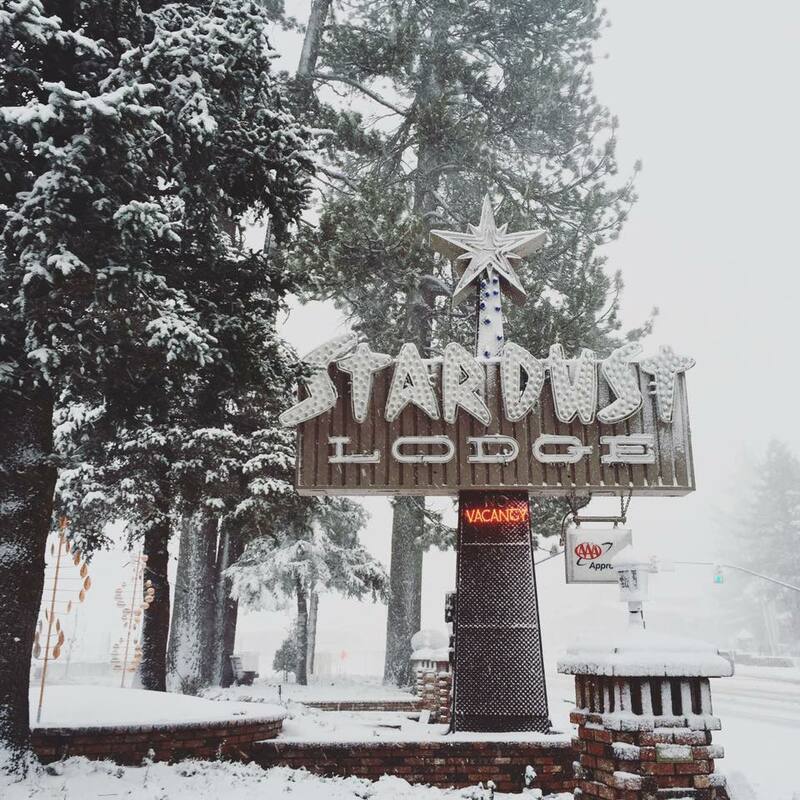 If you've been following along with any and all of my social media recently, you'll know that I was in Lake Tahoe last week where it snowed like crazy! (Insert a thousand snowflake emojis here) It hasn't snowed this much while I was here in a few years, so I didn't pack as much "snow gear" as I should have. So, I decided to make a post about the things you'll definitely be needing if you're going to have a white christmas! I just bought this jacket from Patagonia, and tested it out in the snow while I was in Tahoe. I stepped outside in the 19 degree weather and literally felt nothing. It was so warm and toasty, and if it got colder outside I could just slip my bigger jacket over it! 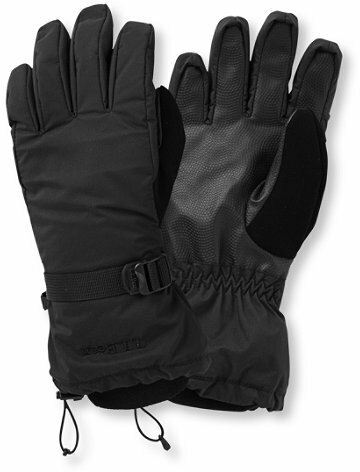 I have gloves from Target that were just a little too thin for the snow, so I think these ones above would be perfect! No, they aren't the prettiest gloves I could find, but they got some great reviews and look extremely thick and warm! 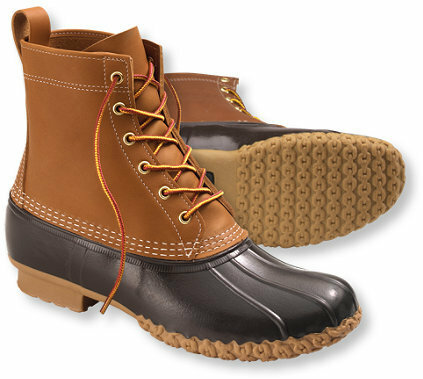 Although I don't own a pair of Bean Boots, I again have heard amazing things about them. They are waterproof (perfect for snow!) and have grips on the bottom that help prevent you from slipping on ice. Also, be sure to wear some thick socks, your feet get surprisingly cold! 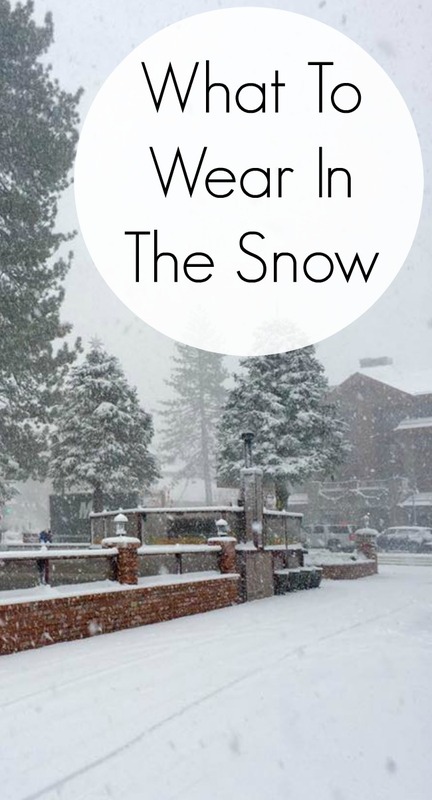 Not too much, but these are the things I was thinking about when I was shivering up in Tahoe! In other news, do you guys have any fun vacations or holiday plans coming up? As I said in my last post, I'm in Lake Tahoe for Thanksgiving, and unfortunately for me, there is no mall here to go Black Friday shopping. Cyber Monday always ends up being my best friend, but this year, so many stores are offering up their online sales before Black Friday! 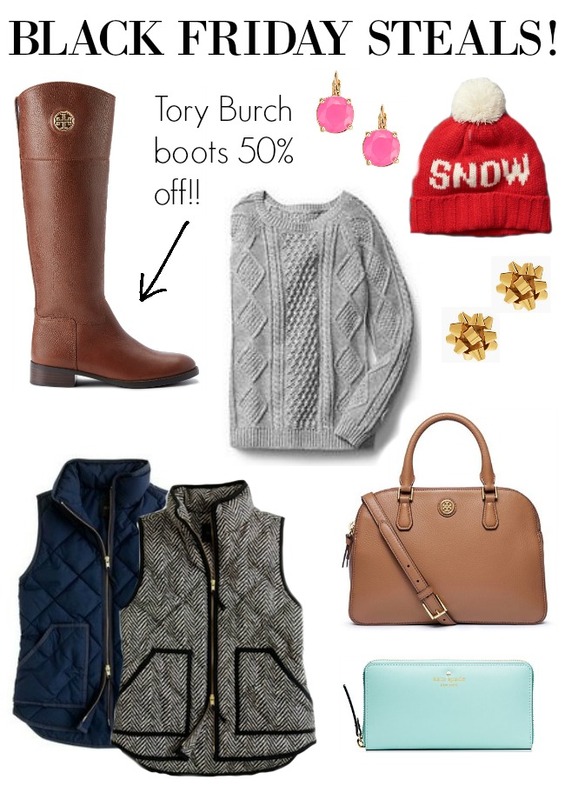 I already ordered myself my first pair of Tory Burch boots because I couldn't pass up the current 50% off deal! I've gathered up some of my favorite deals and a few other sales below! 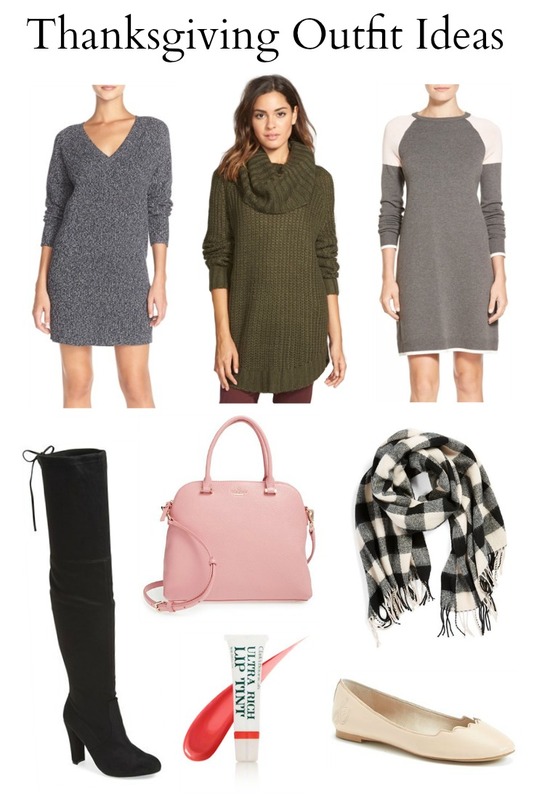 Nordstrom // New items on sale and price matching! I mentioned this in my Thanksgiving Outfit post, but my family never really has a traditional thanksgiving. We head up to Lake Tahoe every year, and never really do the same thing for the day of Thanksgiving. Since we don't have a place to cook a traditional Thanksgiving meal, we normally go out to a buffet somewhere in town that has everything we need to create a somewhat regular atmosphere of the holiday: mashed potatoes, turkey, pumpkin pie, you name it. I love going up here and when it snows it's a truly magical experience (especially since I go to school in SoCal where it barely dips into the 60s during this time of year.) Lake Tahoe is one of my favorite places in the whole world, and although I sometimes get a little sad not having a traditional Thanksgiving, I wouldn't choose to celebrate it any other way. Friendsgiving doesn't have to be something to be ashamed of or saddened by because you aren't with your family. Think of it as another way to bond with those closest to you and have fun together! I personally haven't experienced one myself, but I know that any extra time spent with friends is bound to be a good time. Although the tradition of Thanksgiving is supposed to be about spending time with loved ones, if you aren't able to, that doesn't mean that the holiday is going to be any less fun or special. I'm a big advocate for the occasional untraditional Thanksgiving, because it makes for some great memories that could possibly start some new traditions for you! Now, I'm not saying there's anything wrong with having a regular Thanksgiving (because seriously what's better than family and a large home cooked meal? ), but if you're like me and have an untraditional thanksgiving, I would love to know how you celebrate the holiday! This post is a part of the #galpalholiday link up hosted by Cristina, Rachel, and Cathleen, so be sure to check out their blogs as well as the other posts in the link up! You have to study a completely different way for essay-based tests than you would for multiple choice tests. I've taken several classes in college so far that require a blue book rather than a Scantron and they can be quite the challenge. I'm in a class this year where we learn a whole slew of information over the course of a few weeks, and then, when given the exam, we are to answer only one question. The catch? We don't know what he's going to ask, so we have to study all of our notes. There's no multiple choice or fill in the blank, just blank lines of solitude waiting to be filled with what hopefully isn't BS (so help your grade). I've done well on these tests, and I really credit my study tactics for this type of test. In just a few simple steps, you can be prepped and ready for your next bluebook exam! This takes me approximately two days if I do it for two hours each day (math: 4 hours). I choose to rewrite mine by hand, but you can type them if you wish; whatever works best for your studying purposes. Make sure to write clearly and neatly, and use this time to locate any missing information. Call up some friends, use the Internet (wisely), or consult your textbook. This is not just coloring. Highlight main words/phrases, so that they'll pop out at you as you study these notes. I use different colored highlighters for different things to keep everything organized! -highlight the words "all" and "matter"
There are two good ways to do this. Option 1 is to use notecards. Write your titles on the front and the main ideas on the back. Continue to study the notes guide you have made, but also implement using the notecards to really nail down the main points. Option 2 is my method of choice. Next to the title, jot down the main ideas. It can be really simple; maybe just three words that can help you recall information on the subject. Pull out some paper and set your phone timer, it's time to practice! 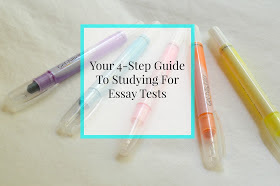 This is a bit time-consuming, but don't fret; you don't have to write a whole essay. I like to write short, incomplete sentences that resemble something of what I really would write on the real thing. The important part is to not look at your notes and see how much you know. If you keep drawing a blank, you'll know what you need to study a bit more. Thanks to Sami for letting me guest post on her awesome blog. You can find me over at cristinaoncampus.blogspot.com for more college tips! Christmas is coming fast and my friend Skye and I decided that we should start getting in the spirit by making our gift guides! Some of these items are bound to be on sale with Black Friday coming up in a week, so best to have your eye on some specific things! I've made three separate categories depending on who you are buying gifts for (or who's buying your gifts…): Affordable ($50 and under), Spend a little more ($50-$100), and Splurge ($100+). My personal favorites from this list are the plaid scarf, the monogram necklace, and the red hunter boots! Be sure to check out Skye's Gift Guide on her blog The Equestrian Scholar! Also, I'm at a bit lost on what to ask for for Christmas, and would love to hear some of the things you all are thinking of for yourselves! Seriously though, help a girl out in the comments with some suggestions! 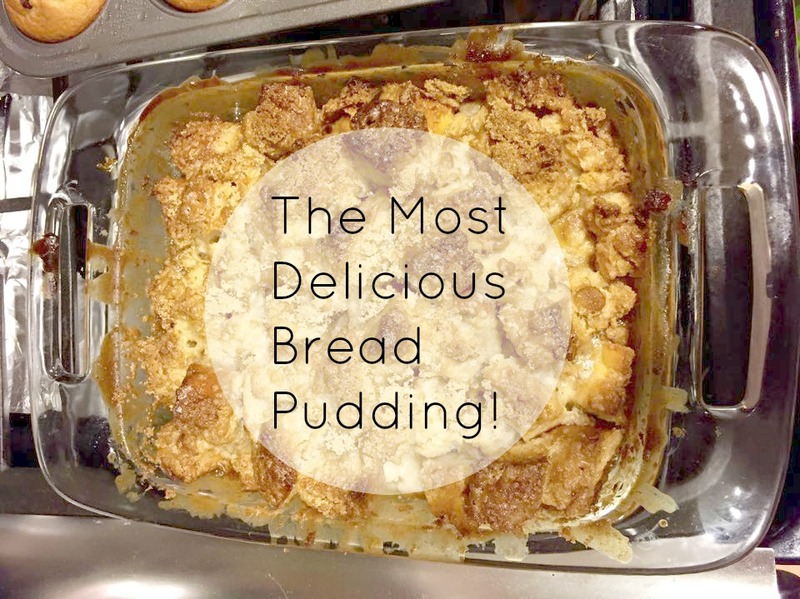 So I'm not the biggest fan of bread pudding, but I somehow pulled off a really delicious recipe that I will most definitely be making on a regular basis. This all started when I bought a loaf of french bread for a stew that I was going to make, but never got around to it. After two days, the bread got really a little stale. I didn't want to waste a whole loaf of bread, so I started thinking of ways to use it. 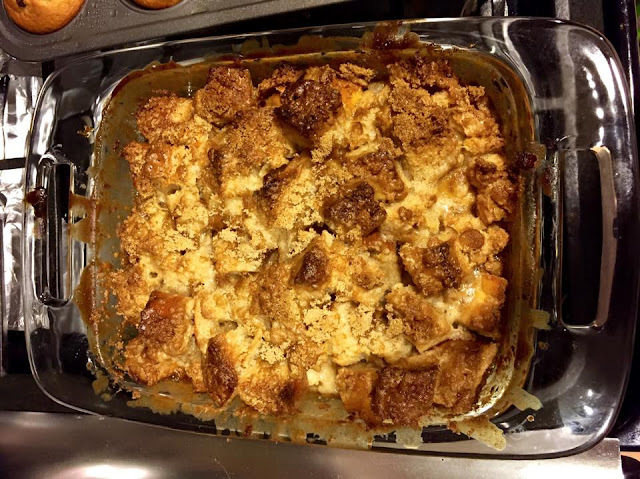 I somehow remembered my mom telling me that you can use stale bread to make bread pudding, and so I decided to go for it. I wasn't expecting much out of this bread pudding, since I was really experimenting with the whole recipe, but it turned out amazingly well. I also wasn't expecting to share this on here, so that's why the pictures aren't really set up, but decided to because it really is just that good! 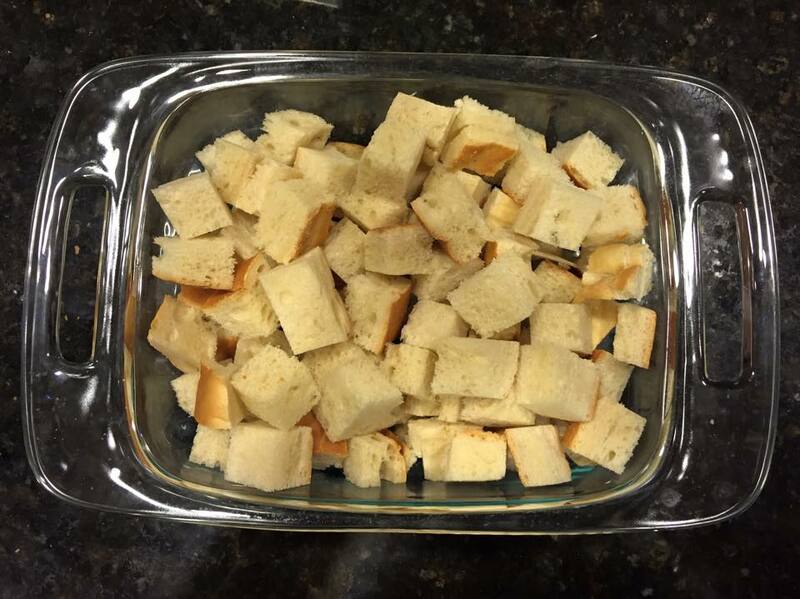 First cut your bread into cubes. I found it was much quicker and easier to cut the bread into slices and cut the cubes from each slice. Cut as much bread as you can until you can't fit anymore into your pan (I'm not sure what size pan I used, but I fit about 2/3 of my loaf of bread). Put this bread into a large mixing bowl. Now combine all the other ingredients into another large mixing bowl. Mix until there are no lumps and all the ingredients are thoroughly mixed together into a fine liquid. Pour the mixture over the bread, and make sure each piece is thoroughly covered. Then pour the bread into your pan (there will be extra of the mixture, make sure that also goes into the pan). Let sit overnight in the fridge. When you take it out, mix up the bread a little bit more to make sure each piece is coated somewhat equally. 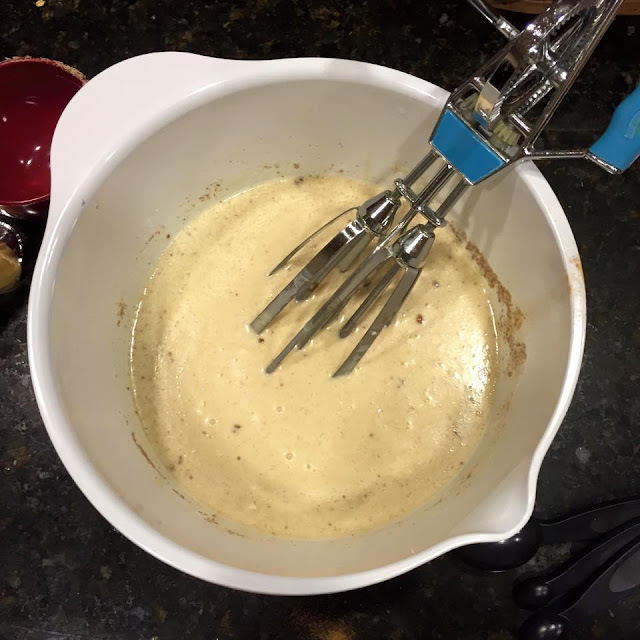 It's okay if there's still some liquid in the pan, but if there's a lot you should drain some of it out in order to make sure the pudding sticks better together in the over. Cover the top of the bread pudding with brown sugar. Preheat your oven to 325 degrees, and cook for 45 minutes. Check on your bread pudding, see if it has "set" in the center (if you can make it jiggle, it hasn't fully set). If it hasn't, cook it in increments of five minutes until it does. Wait 2-3 minutes before serving. 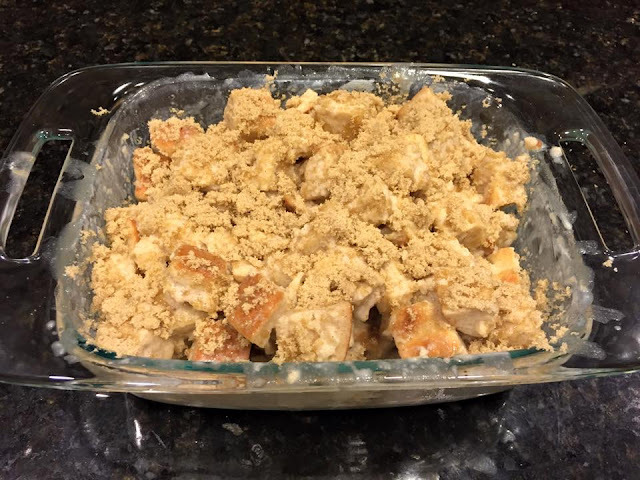 Let me know if you try this recipe, I'm pretty proud of how great it turned out! I'm a jacket hoarder. I live in California, so I obviously don't need a heavy winter jacket, but despite this I always seem to have at least 10 in my closet. (don't judge me!) Maybe it's the fact that I just love the look of winter coats, or I'm always expecting an unexpected, and definitely impossible snow storm, but I am always drawn to them when they start popping up in the Fall. For once I actually have a reason to buy some new, slightly heavyweight outerwear, because I'm heading to the United Kingdom at the end of December! I've been talking about it on Twitter every now and then, and also have a Pinterest board dedicated to the trip. All the plans have finally been set, and it's only starting to seem real to me since this trip has been in the works since last year! Don't you worry, there will definitely be a few posts about it around late December and January. 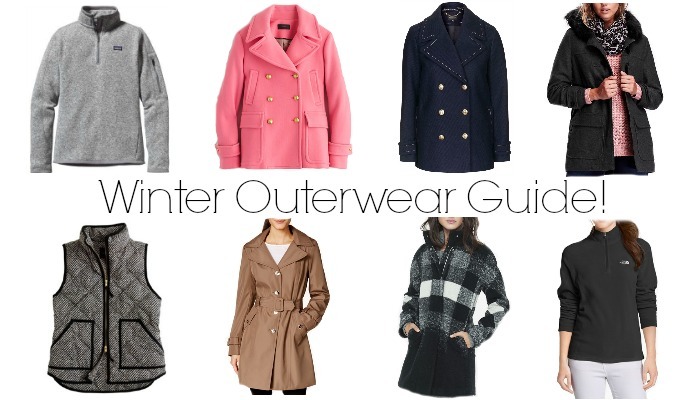 For now, I've picked out a few of my favorite coats, jackets, pullovers, etc. in a bunch of different styles and prices for you to check out! Thanksgiving has slowly become one of my favorite holidays. It means more to me now that I'm in college, because it's a whole week I get to spend with my family! I don't see them too often while at school since I'm down in Southern California and they're in Northern California, but I always get excited for November because it means I get to see them again! My family always goes to Lake Tahoe for Thanksgiving ever since I can remember, so we never really have a traditional Thanksgiving. We go out to a restaurant and just spend time together! It's always cold in Lake Tahoe during November (as it is everywhere else but SoCal!) 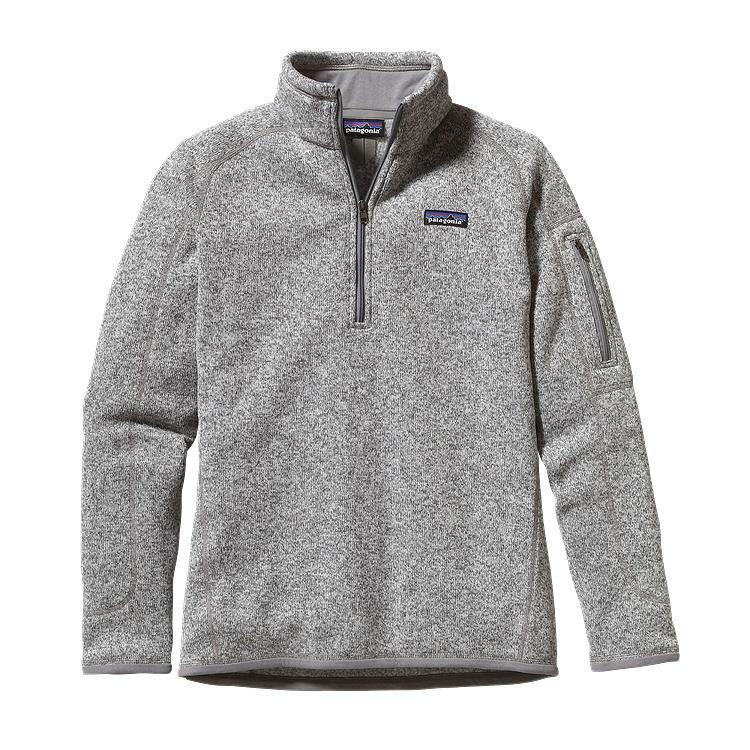 so I'm always trying to find new sweaters and jackets to bring with me to prepare for the snow! I put together a few outfit ideas for you guys because I'll probably be wearing something similar to the above when I celebrate the holiday! Hope everyone's enjoying the colder weather like I am! It just hit the high 60s here, but I'm hoping for a little cooler! Ever have one of those days where nothing seems to be going right? What about when that day turns into a week or maybe even a month? 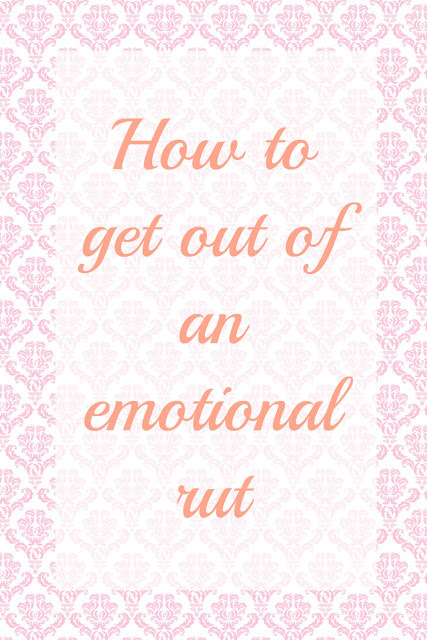 You might be in an emotional rut. Many things can lead to these emotional ruts (as I like to call them), and sometimes it's just a case of bad timing, bad luck, or a combination of the two. I'm going to get a little more personal today, because I want you to know that although my life looks like sunshine and rainbows on here and my other social media, that's definitely not always how it really is. For the past few weeks I've gotten myself into what seems to be a little pit of emotion that I just can't seem to escape. If you follow me on Twitter, you've seen that I've had a cold for the last two and a half weeks, and that's where this all really started. I don't know exactly why, but everything seemed to just continue to pile on all at once. I had a week full of midterms, some personal drama with friends, and some internal issues that I had continued to push down for a while, but decided to come back up at the same time as everything else. I'm not the type of person to complain about my stress and actual issues going on in my life, so it just made it worse when I wasn't talking to anyone about what was going on. I decided to make a post about it because it isn't as uncommon as you think, and I want to give some tips to help those who may end up in the same place as I am. For me it was my parents, mostly my mom because I happened to be texting her when all this stuff was happening, but really it can be anyone you trust. It can be your best friend, your roommate, your sibling, a teacher, a therapist, anyone who will listen and make your emotions heard. Even if you don't tell them exactly what you're going through, telling someone that you aren't feeling so good in an emotional sense can lift a little weight off your shoulders. I know it can be hard to share things with other people sometimes, it's one of the most difficult things for me to do, but I promise even if you just give a little it will help give you a little more peace of mind. I have a personal journal that I use from time to time (I write outside of my blog?!) to get out everything that's bothering me. If I don't want to share details with anyone I'll write it all in there and again it's just another way to force out whatever emotion you're feeling from being bottled up inside you. It's a weird tip, but it helps. It soothes all the muscles in my body (especially when I'm sick!) and de-stresses me when I feel tense. It's my best thinking place, and when I'm in there I feel like I can organize all of my thoughts into where I want them to go. Obviously you can't just spend forever in the shower if you're having a bad day, but take a long one just to really clear your mind and loosen up your body. Feeling like everything around you is just uninteresting, or maybe you're just bored with your surroundings? See a new movie in theaters, go to a new restaurant, meet up with some friends you haven't seen in a while, do something that's fun but not something usually in your schedule. Make some time for yourself too, and do some things that always make you feel better! These may not be the best tips in the world, but I wanted to do what I could to help people who have been where I am now, or end up where I am in the future. Life is stressful sometimes, and sometimes everything comes at you all at once at a rate where you feel like you're drowning. Remember keep your head above water and keep taking small steps to pull yourself out of the funk you're in. A few days ago I got the news that I was chosen as a representative of USA Palm! I have been following their brand on twitter for a few months, and every time they post pictures of their shirts I want to buy them all! Their long sleeves always look so comfortable and perfect for the upcoming cold weather! One of the things I love most about them though is that 10% of their net profits go to oceanconservancy.org to help protect and save the ocean and marine life! 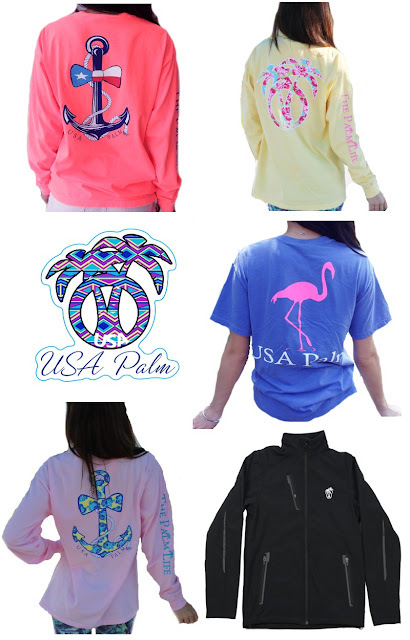 Each shirt is from comfort colors, so they're extra soft and comfy! Here are a few of my favorite items from their website, be sure to use my Rep code: RepSamiM to get 10% off your purchase! There are also a few things out of stock that I'm absolutely obsessed with (like this adorable dog long sleeve! ), so keep checking the site to see when they come back in stock! 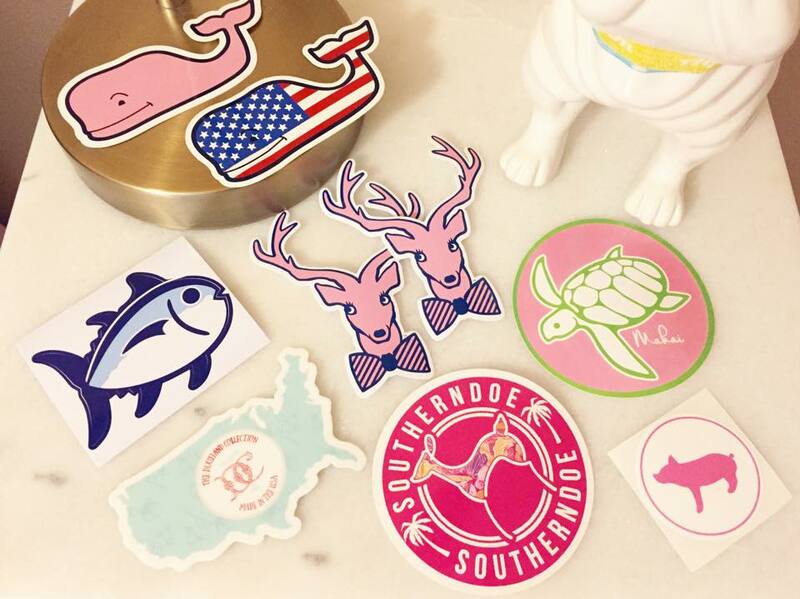 The Best Gifts For Your Sorority Little! Long time, no talk! Hey lovelies I'm back from my little break. Midterms are (almost) over, and I'm ready to get back to my normal life, which includes blogging! Over the past few weeks I've had many things happen, and can't wait to share with you all. One of the things that happened was that I got a little in my sorority (I'm in Alpha Gamma Delta btw)! I never thought I would be super excited to be a big, because I didn't think I would find someone who I thought would get along with me so well. I was wrong. One of our new members is basically a carbon copy of me, we even have the same major, and with history that's something that doesn't normally happen, and we had class together so we were talking constantly. After lots of worrying whether someone else was going to take her, I got paired with her! And then the threat and stress of spoils week was upon me. My roommate also got a little, so we started crafting like crazy and making numerous trips to the dollar store to add more to our gifts. Our spoils week is 5 days long, so I started my gifts small and went progressively larger. I'll show you guys what I gave my little and then give you some more ideas at the end of the post! 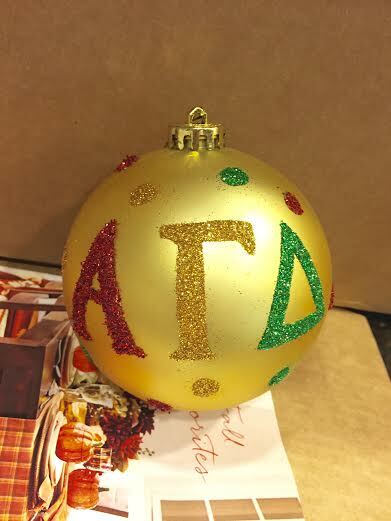 I bought this ornament at the dollar store, and then decorated it with glitter! 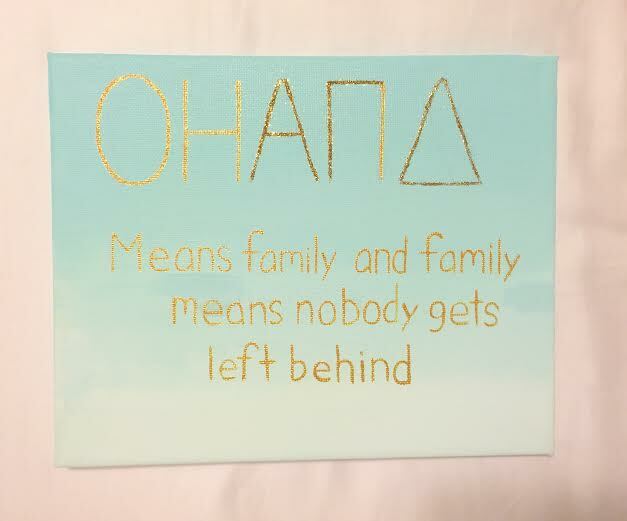 It was super easy to make, and easy to design with your own letters! Other things I added to this day were a hat in the shape of a turkey (her favorite holiday is Thanksgiving! 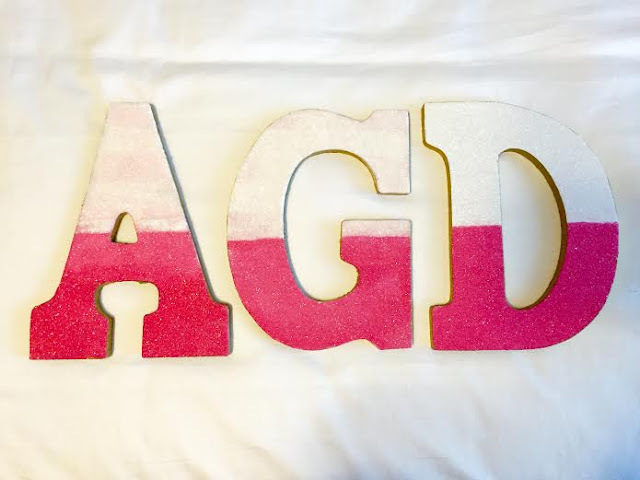 ), a water bottle, a mason jar full of candy for Halloween, and a set of pearl earrings and necklace because they are Alpha Gamma Delta's "gem." In Alpha Gam we have a thing called The Purpose, and it is basically how we have specific ways in which we try to lead our lives. 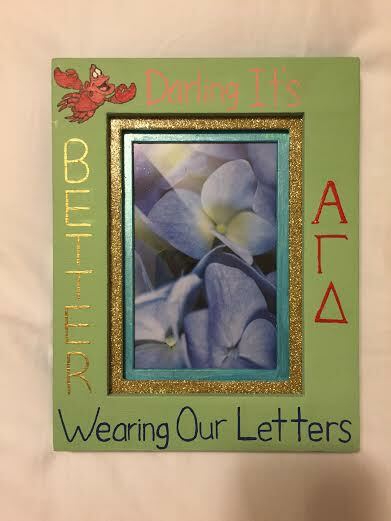 I repurposed a frame that my big gave me, keeping the purpose that she made for me, and replacing the one in the frame with one I made for my little. I also passed down a set of rose pens that have been in my "family" to my little. Roses are Alpha Gam's flower, and I loved when my big gave them to me! 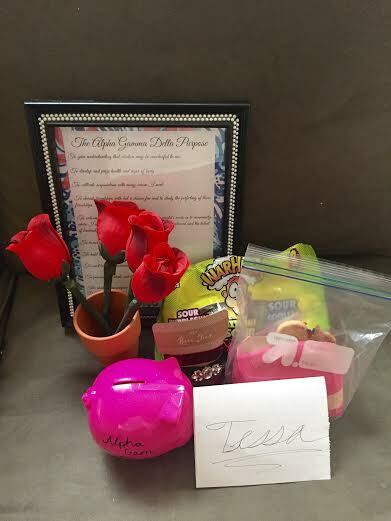 I also gave her a cute little piggy bank to help her save money for the sorority's dues. My roommate and I also baked cookies in the shape of squirrels (AGD's mascot) and I also gave her a set of hair ties and sour candy! 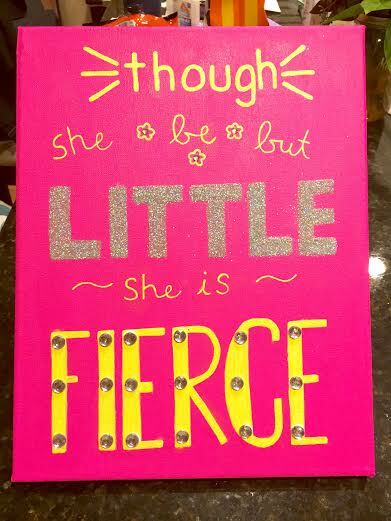 This is by far the easiest gift to get together for your little! Gather up some manicure and pedicure supplies, some apple cider, some magazines, your favorite movies (I gave her a four pack of rom coms that just happened to have two of my favorite movies in it! Bride Wars and What's Your Number!). Some of the items in my basket were also hints to who I am. 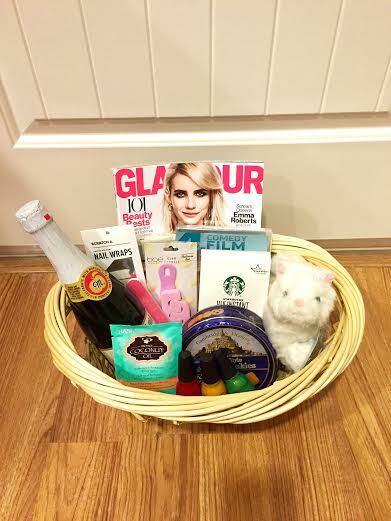 I gave her a cat stuffed animal because I love cats, some British cookies because my mom is from England, some Starbucks because it has become an obsession ever since we got one on campus, and for the magazine I picked one with Emma Roberts on the cover because I've been obsessed with watching Scream Queens! It's an unspoken rule that if you go to Chapman, you have to love Disney. With it being 15 minutes from campus, it's kind of hard not to. I did most of my crafts for this day, and I have to say, I'm extremely proud of how these turned out! 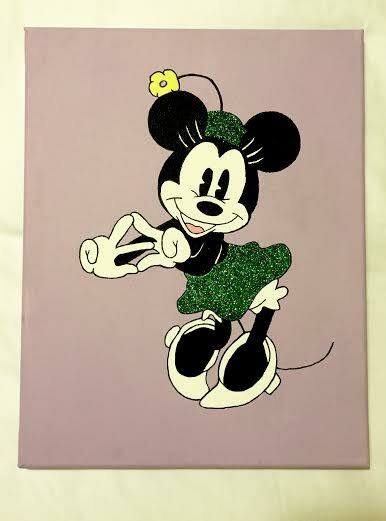 I'm thinking about making a separate post on a tutorial for the minnie mouse canvas, thoughts? I struggled on what to put my gifts in most of the week, but found this cute box at Ross for less than $5! Michaels was also having a sale on baskets, so the two baskets that I used for Day 3 and Day 5 were also less than $5! I went all out on the last day with basically every pink thing that I could find. One of my little's favorite colors is pink, and thank god because I had already collected an obscene amount of stuff for that day. I made her a tie blanket (super easy Pinterest tutorial! 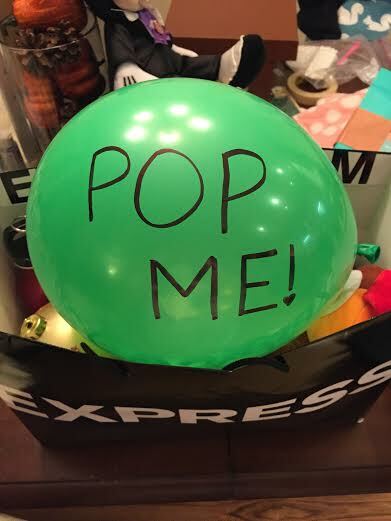 ), glitter letters, candles, lip balm, lotion, and lots more! 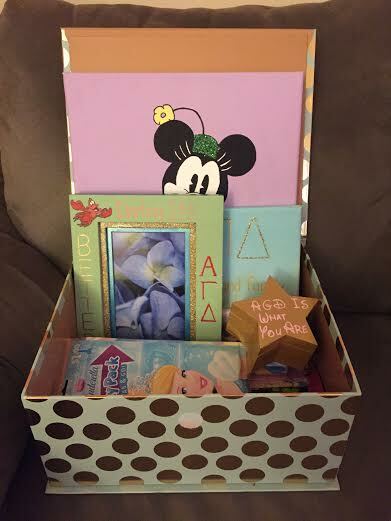 Gathering gifts that are your littles favorite color is a simple way to make a themed basket! 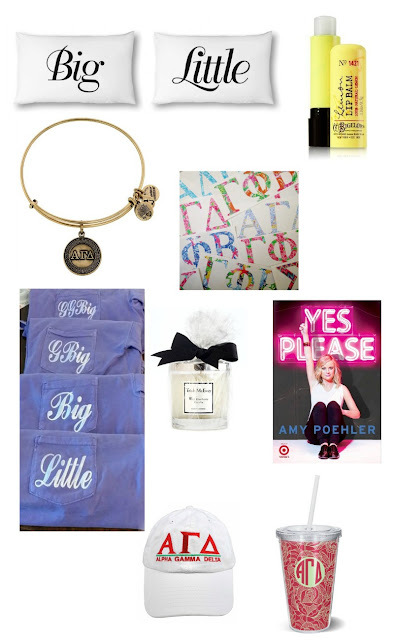 Here are some other gift ideas that are perfect for your sorority little! Also, don't forget to check out my post on Sorority Recruitment! I'm incredibly busy this week what with midterms and it being spoil week for my sorority, so I just wanted to apologize for not posting! I'm basically going to be taking this week off to get my life together haha. In the mean time, here are are a few cool links to keep you busy! Check out the Shop Bop Sale! Easy Halloween costumes you can make with a t-shirt. Have you seen Nick Jonas's music video for Levels? This Trippy Double Makeup Look is so cool and different for Halloween! Also congratulations to Alyssa who won my giveaway! Woohoo! 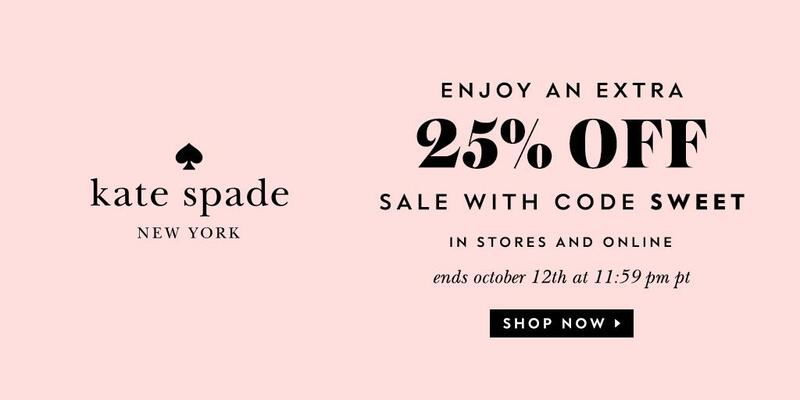 Kate Spade is one of my favorite designers, and right now they're having an extra 25% off sale on their existing sale items! The sale goes until October 12th! What are your favorites? Have you ever looked at someone's laptop and noticed it was covered in super cute stickers? Ever wonder where they got those stickers? Well wonder no more! I did a little research, emailed a lot of people, and filled out a lot of requests, and have come up with a list of places that will send you some! I've linked to each website's sticker request form if they have one, otherwise I've linked to the company's contact page! You don't have to send any self-addressed envelopes for these ones! Some of these places I filled out sticker request forms, and others I simply emailed the company asking if they had some stickers so I could represent their company. I only asked companies that I was truly interested in their merchandise, because otherwise it's not really fair for the company to be giving you something. 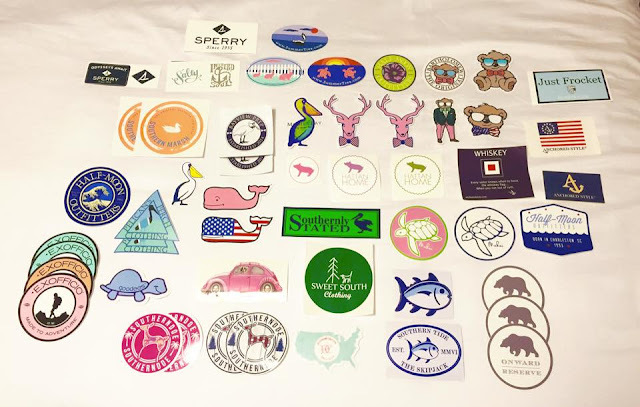 I'm going to help one of you get started on your collection by giving one of you a few of my own stickers! Just enter the giveaway below(US residents only)! The winner will be announced next Wednesday.